Ashley Kerr sings beautifully in her Wellingtons. She was not born to be a gardener. Surprise! Nardo (formerly Robert is a lusty baritone who often tiptoes around the garden as he waits for love.Here he seduces the at first unwilling Alisa Jordheim, who accedes in the end. The confused Count sung with force and drama by SPencer Viator is bound to Kristin Gornstein, who is magical in her trouser role. Kristin Gornstein (Ramiro), Jonathan Blalock (Podesta), Ashley Kerr (Lady Violet/Sandrina), Jorell Williams (Robert/Nardo), Alisa Jordheim (Serpetta), Spencer Viator (Count Belfiore), Maeve Hoglund (Arminda). New York, New York through May 12. On Site Opera is committed to producing in a place that echoes the theme or setting of an opera. 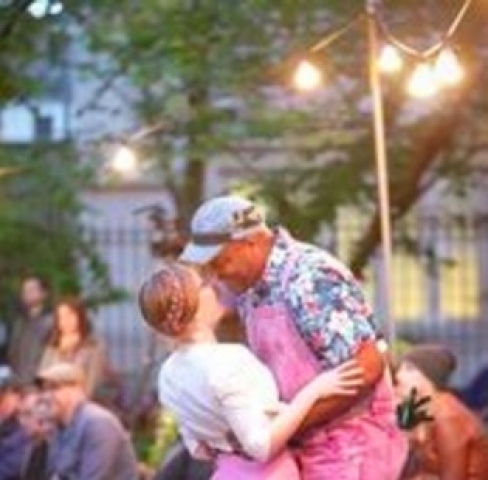 The enchanting West Side Community Garden provided the set for an early Mozart opera. The cast was superb, picking tulips, dashing through flowerbeds, all for the seeming purpose of finding love. Where better to look and listen than a garden? 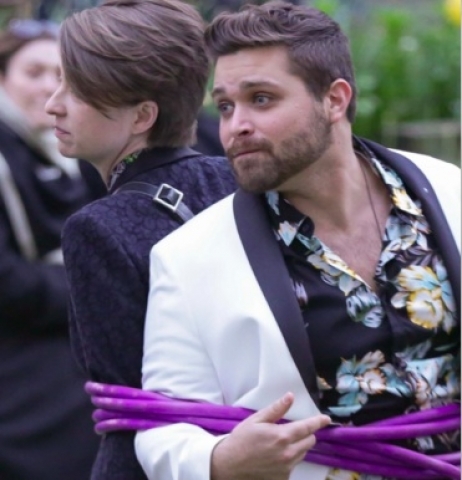 Mozart’s early opera The Secret Gardener has many charms and they are highlighted in this new edition by On Site Opera collaborating with Atlanta Opera, where the show will be presented in the Atlanta Botanical Gardens next week. Complaints about endless recitatives are corrected by cutting. An opera which ordinarily clocks in at three hours and twenty minutes, now is compactly condensed to 90 minutes stem to stern without intermission. Set in a garden to which the presumed dead Lady Violet has retreated, disguised as a gardener, the lovely Ashley Kerr has allied with Robert, disguised as Nardo. Kerr’s soprano is rich and deeply felt. Jorell Williams as her workmate is the star of this show, bringing a firm and shaped baritone and delicious details of his acting to bear on the role. He brandishes a red rake as though he were a matador and the puns are crude and very funny. Is he a rake? On Site’s choice of location in Manhattan is a garden lodged between two buildings that act as a sound chamber. Although you sometimes wish Mayor DeBlasio had as much feeling about opera as Mayor David Dinkins did about tennis when he banned flights over Arthur Ashe Stadium during the US Tennis Open, neighborhood sounds seldom distract. Singing in an English translation credited to Kelley Rourke, this triple romance colored by assumed murder and fights ranging from tiffs to walk-offs, is a hoot. Spencer Viator sings the thankless role of the Count with a soaring tenor that triumphs over the personality of his character. Jonathan Blalock makes us believe that Podesta, the owner of the estate in which everyone lands up, is as confused as the characters often are. He is a dashing actor in a thankless position. Kristin Gornstein in a trouser role completes the cast with panache. Maeve Höglund, who we don’t hear enough, sings Arminda with her big, luscious tones, bringing drama and feeling to each note. She contrasts with Serpetta, who is tiny and sports glasses in an officious manner. Sung by Alisa Jordheim with a slight edge, this bossy character can still enchant. Since everyone lands up with someone else in the end, the appeal of each character is important to the plot. Director Eric Einhorn succeeds in pulling off a conclusion in which all’s well that ends well. Geoffrey McDonald takes on the daunting task of conducting the chamber orchestra with style. Gardening tools and flowers are amusing and apt as props. Flowers are strewn all over the place. A hose provides cord for binding two characters, and watering cans keep the garden growing. Lights strung up around the central courtyard changed colors to fit the emotional moment. Was Leonard Bernstein inspired by this early Mozart when he wrote the final song for Candide, “Let us try, Before we die, to make some sense of life. We're neither pure, nor wise, nor good, We'll do the best we know. We'll build our house and chop our wood And make our garden grow..."
With the ever-delightful Mozart music pared down for maximum pleasure, On Site again brings out treasures from the repertoire and makes our garden grow with beautiful music and singing.